What is the one essential item you need for kids in Singapore for outdoor play? Sunscreen protects the skin from the harmful rays of the sun. Being near the equator, it would mean that we get a huge dose of sunshine on a daily basis. As such, it is necessary to apply sunscreen to shield from harmful UV rays. Given our weekly escapades around town and beyond, it is necessary to pack a bottle of sunscreen with us to protect the kids from the sun. Getting 'Chao Ta' after a day out is no joke and not to mention painful for any kid who gets sun burn. Before finding the ‘right’ sunscreen, the boys had complained about sunscreens that are either too sticky, too smelly or make them itchy. At times, we know the sunscreen is not effectively especially when they look like cooked lobsters. It also means that painful experience with peel skin are almost a certainty in the days ahead.. Thus convincing them to put on sunscreen has always been a challenge due to past negative experiences. Searching for the appropriate sunscreen to use had been a trial and error affair for them , so how do we choose the right’’ sunscreen to use? Upon extensive research ( i.e. Google) , we reckoned that these are the essential items we need in a good sunscreen. Sunscreen should have Ultra Violet B (UVB) protection. UVB penetrate the upper layers of skin and causes burn. When it comes to kids, it is always advisable to be a little more cautious given their vulnerability. For most SPF 15 would be suffice for a day out. For kids with fairer skin, SPF 50 + will give parents a peace of mind and a protective shield for kids under the sun. Other than UVB protection, you would need to protect yourself against Ultra Violet A (UVA) . UVA penetrated deeper into the skin and cause visible signs of aging such as skin spots and wrinkles. Surely we do not want the youthful child to look beyond his age after a few sessions under the sun. Sunscreen that has PA ratings would provide protection against UVA. The more + behind PA will mean a higher level of protection. Sunscreen should not be sticky in nature. Kids would hate any lotion sticking to their skin. Instead choose one that has a smooth texture. Add moisturizing ingredient and it will be a perfect combination. There are sunscreens out that that leaves patches of white residue and therefore rough skin. Choose one that leaves skin smooth and comfortable with no white residue that are unsightly and hard to rub off. Since most of the time sunscreen is applied due to outdoor activities such as swimming or any other activities under the sun, it should be water and respiration proof for a longer lasting effect. Do note that sunscreen are not 100% waterproof, so do apply in regular intervals to maintain the protection. As a young kid's skin is sensitive, it is best avoiding sunscreen with alcohol, fragrances or preservatives to prevent skin irritations or allergies. Different sunscreens have different chemical characteristics. It is best to find one that is made specially for kids and not rely on the adult brand you use for yourself. 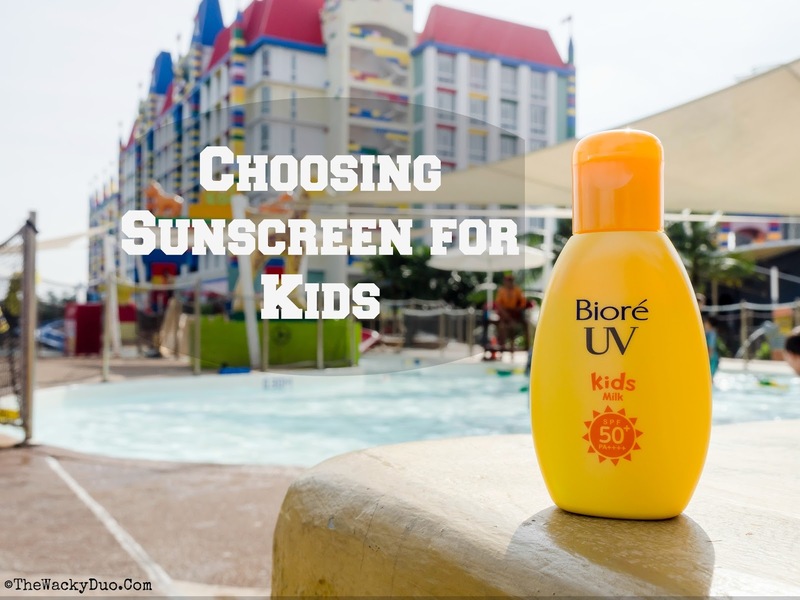 Regardless of the kind of sunscreen out in the market, parents would usually go for a brand they trust. Brands that had been around for a long time and are known to specialise on skincare always score extra stars on our books. Guess which sunscreen fits the bill? Introducing the new Biore UV Mild Milk (for kids) SPF 50 + PA +++. SPF50+ PA +++ for UV protection. Ultra light Smooth Milky Texture. Leaves skin smooth and comfortable with no white residue. PH balanced formula and free of fragrance, colorant or alcohol for soothing protection for delicate skin. Read the full article at The Asian Parents to find out about the result of our day out with Biore UV Mild Milk!